E181 is a great short for anyone looking to improve shoulder health. Coach Joe discusses a simple adjustment and some programming options for the kettlebell arm bar. 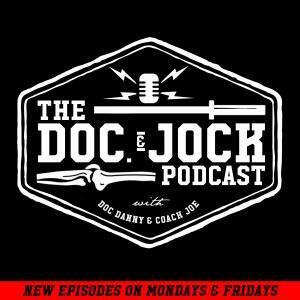 Linked below is Coach Joe working through the Arm Bar and another clip from past guest Doug Kechijian who rekindled Coach Joe interest in this movement. The major adjustment and tip in this episode is when the bell is up and you are on your side to relax your neck and take your eyes off the bell. Doing so forces your shoulders to do the heavy lifting and stability work. Regarding programming keep it simple! As a prep peice load and reps should be light. Why would you want to fatigue the rotator cuff muscle you will need for stability sake in working sets? The short answer is you wouldn’t. Its Coach Joe’s opinion that heavy arm bars are best utilized as a post barbell session auxiliary piece or as a stand alone shoulder strength, prehab or rehab piece. Gang this moves gives you a lot of bang for your buck but remember, Coach Joe is a Jock, not a DOC so consult a PT near you who trains. If you PT doesn’t know what a barbell is he or she will probably just tell you to not use one!